1Like most police officers, Hispanic officers have mixed feelings about their work. A majority of Hispanic police officers (63%) say their work often or nearly always makes them feel proud, a share similar to that of black (60%) but slightly higher than among white officers (58%). 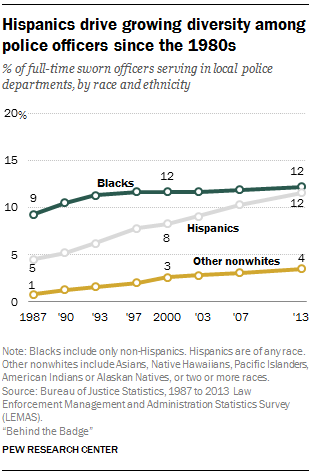 And 47% of Hispanic officers say their work often or nearly always makes them feel fulfilled. At the same time, though, many Hispanic officers express frustration about their jobs. Roughly half (47%) say their work often or nearly always makes them feel frustrated. In addition, about one-in-five Hispanic officers (21%) say their work often or nearly always makes them feel angry. 2 Views of Latino officers on fatal incidents and the ensuing protests mirror those of white officers. 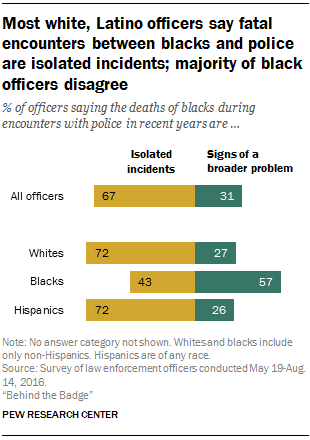 Roughly seven-in-ten Latino and white officers (72% of each group) say recent fatal encounters between blacks and the police are isolated incidents, rather than signs of a broader problem between blacks and the police. 3 Similar shares of Hispanic officers and white officers say high-profile incidents between blacks and police have made policing harder. Seven-in-ten Hispanic officers (72%) say that officers in their departments are now less willing to stop and question people who seem suspicious, a share similar to the 73% of white officers who say this. Roughly two-thirds (64%) of black officers say this. 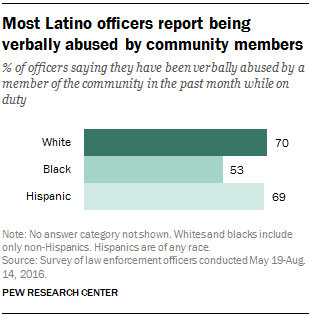 In addition, Hispanic and white officers are more likely than black officers to report having been verbally abused by a member of the community while on duty in the past month. 4 A majority of Latino (60%) and black (64%) officers say it should be up to federal authorities to identify undocumented immigrants. On the other hand, a majority of white officers (59%) say that when it comes to identifying undocumented immigrants, local police should take an active role.